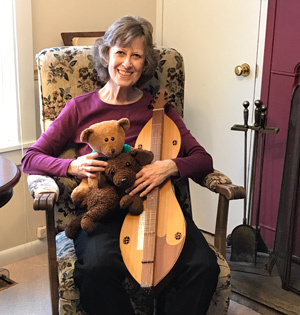 A music educator, performer and transcriber, Felicia taught elementary general-choral music and beginning strings for 31 years in West Virginia. She earned her B.A. and M.A. in Music Education at Marshall University, and was West Virginia’s first music National Board Certified Teacher. Felicia teaches and performs with her voice, cello, guitar and Appalachian dulcimer in West Virginia and Maryland. She performs in 1870s Appalachian attire as “Aunt Jane,” and with Side by Side Renewal Ministries, as well as with the Allegany Community Symphony Orchestra and the Buckhannon Chamber Orchestra. She has written and performs a musical narrative about her southern WV grandmother, Daughter of the Guyandotte. She serves as Publications Editor for the Maryland Music Educators Association. Felicia has transcribed eight children’s songs written by Mary Alice Deveny, using the digital notation program Sibelius First, for Molly Brave’s planned production of Through The Screen Door.